Thanks for visiting my blog! Check out more work in my galleries. Purchase Giclee prints or original artwork. Sign up to get blog updates on painting and writing. I just finished reading You Must Change Your Life – The Story of Rainer Maria Rilke and Auguste Rodin by Rachel Corbett. As of this date, it’s my favorite book of this year. I’ve always been a Rilke fan, reading and re-reading Letters to a Young Poet and Letters on Cezanne, but after reading You Must Change Your Life, I have more insight into the personalities, anxieties and gifts of both these men. Three pages from the end of the book, I read words that reminded me of a painting I did in 2013. I named it “Becoming Whole” but didn’t think that said enough. I changed it to “As a Willow,” trying to bring out the tree that was part of the young man’s face. Today, I changed the title to “Worldinnerspace,” a word Rilke coined “to describe the space where the barriers between the internal and external collapsed onto a single plane. It is a realm where the self is like a bird flying soundlessly between the sky and the soul, he said. Rilke accepts the concept as both a contradiction and a reality in a poem titled “Worldinnerspace”: “O, wanting to grow, / I look out, and the tree grows in me,” he writes. 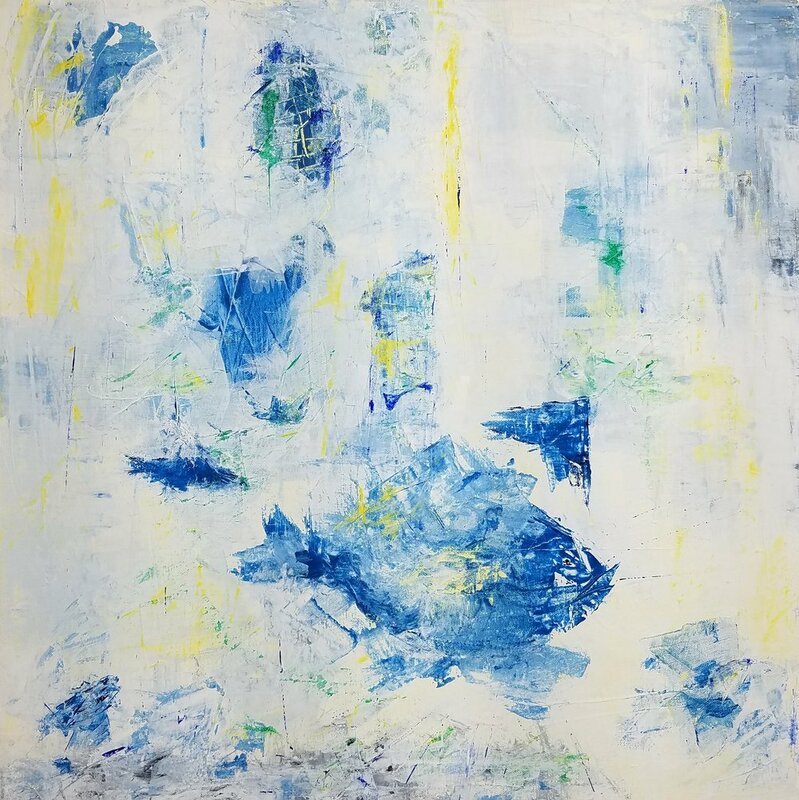 “Worldinnerspace” was painted in early February, 2013, 20 x 20” and is many layers of acrylic, some of which were poured over the entire canvas. I used brushes to develop the face, the partial faces and the tree. In March, my friend Liz spent a couple of weeks in Paris and Berlin. Mixed in with brief texts about art galleries, museums, the cemetery where Susan Sontag was buried and The Shakespeare & Company bookshop were comments about cafe hopping. I began to see images of the outdoor cafes I had frequented while in Germany and I knew Paris would have even more. An integral part of life, the cafes offer a sense of community - opportunities of conversation with both friends and strangers, a place to work or write while still among people. But cafes are also places to just be - places where no one gives a second thought to a person sitting alone with a drink, a book or a laptop. Now you can create your own story about an afternoon at the outdoor cafe. At the Outdoor Cafe was painted with acrylics and a palette knife. For three years, I sang in a bar - just me and my guitar amidst the quiet and the rowdy, the depressed and the happy. If I sang something they knew, they joined in. If they didn't know the song, they kept talking or continued to stare into their chosen drink. When I took a break, they talked - about anything and everything. This painting reminded me of those days and I thought of Billy Joel's Piano Man - the embattled aspirations of the people around the bar and how much easier it was to become another person in the dusky-dark of the place. They Come to Sing the Blues is a satirical look at the people in the bar, singing with the piano man - inhibitions dropped, personalities changed, singing to another life. 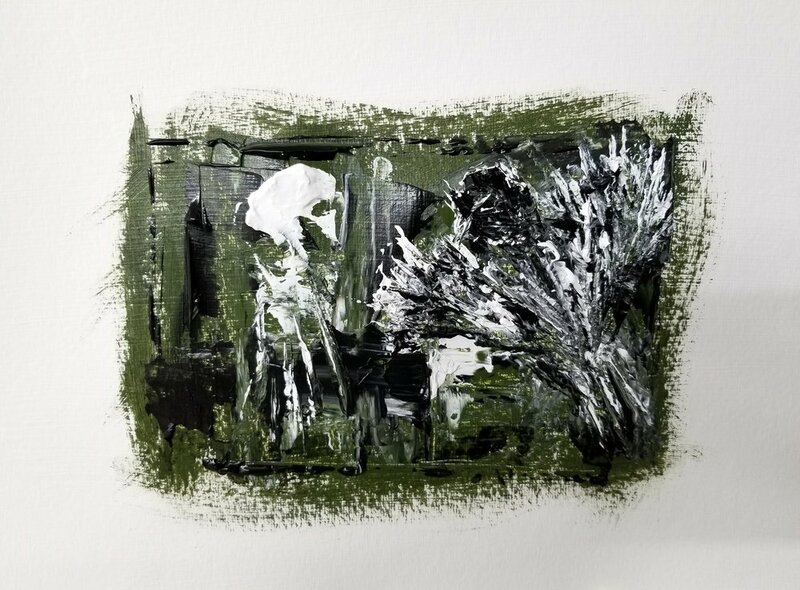 This painting used a limited palette of gray-green, black and white acrylic on watercolor paper and was created with a brush and a palette knife. In this painting, the city is almost there but not quite. It’s imaginary – an imaginary place where everything is as bad as it can be (according to the British dictionary’s definition of dystopia). I choose to keep this as an imaginary place, the setting of novels and stories. I will let it make its own statement, let it be bold in its chaos and lack of physical definition. 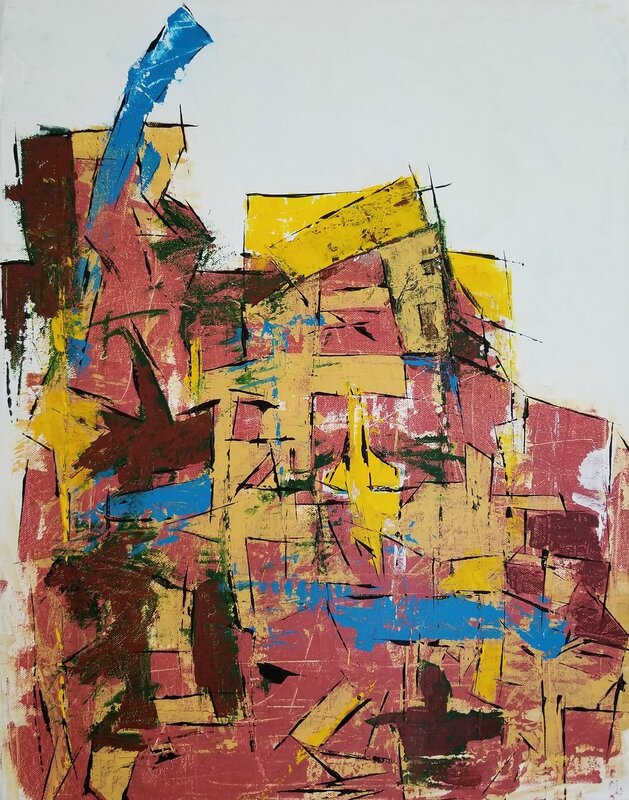 “Dystopia” was created by layering acrylic paint then scraping and scratching (in various stages of drying) each layer to expose glimpses of the paint beneath. After applying the final layer of paints, I sprayed the canvas with water, once again scraping and scratching but not as deeply as with the other layers. In “Dystopia,” I choose to see fantasy but I acknowledge the possibility of reality – a reminder that we all are responsible for our planet, our cities and towns, our citizens, ourselves. This morning, I heard that our infamous Spaghetti Junction in Dekalb County had received the dubious honor of being the most dangerous intersection in the United States for the third year in a row. I thought it was time to dust off an older painting and write about it. Around June last year, I received my weekly letter from Austin Kleon (austin@austinkleon.com) and he mentioned the book Montaigne by Stefan Zweig. After reading his comments and a book review, I purchased the book and thoroughly enjoyed it. In December, I received a newsletter from Ryan Holiday (ryan@ryanholiday.net). This man reads a LOT of books! There was Zweig’s Montaigne again, which he called “brilliant, urgent,” and he listed it as one of his favorites read during 2017. Thinking about all the books I read in 2017, the one that kept returning to my mind was This Gladdening Light: An Ecology of Fatherhood and Faith by Christopher Martin. If you’re looking for a good book, any of these would be a great place to start. Enjoy! Stormy Night was painted with brushes, knives and rags. I used this combination to create movement – storm against city. It is definitely a mood piece and could be interpreted literally or figuratively. Often, the paint tells me what to do. That was the case in Out for a Swim. My original thought was to paint using layers, smears and a few geometric designs. Then I saw the fish. I changed course and created a water scene with fish swimming between glimmers of sun. What started as a geometric pattern became a layered image of a woman moving through time. She’s complicated, intense, invigorated, determined. “Woman on the Move” was painted with palette knives and brush pens. I read Anthem by Ayn Rand years ago, but her words lingered. If we lose sight of our existence, we can be duped into following a "pied piper" and lose our individual identity. In Anthem, a young man and woman begin to see beyond the sterile community around them and leave to develop their own society based on individualism. An Anthem for the Individual developed over a painting in progress. I used the brown and white already on the canvas as an underpainting and layered yellows with a palette knife. 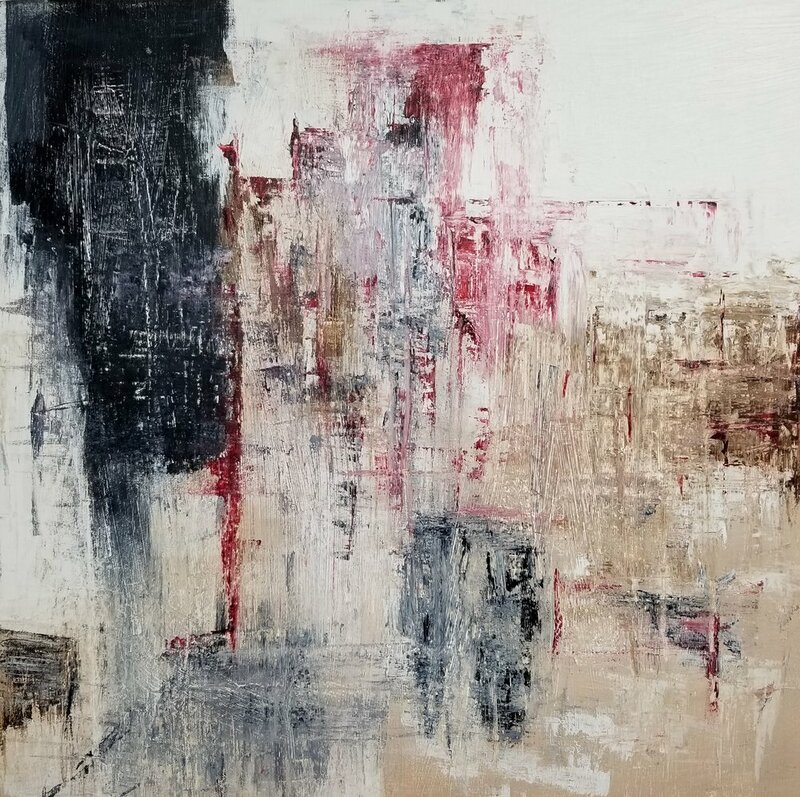 When the imagery began to emerge, I developed the city, using the edge of several palette knives to create a suggestion of a very stark looking urban setting. The darker yellows in the sky are hints of mountains in the distance. The lone figure leaving the building is the symbol for the individual. Is The Road literally an extended pathway of asphalt, dirt or gravel moving somewhere in the distance or figuratively, a mental journey of endless possibility? After brushing and drying several coats of white paint on the canvas, I put down artist tape to outline a road that seemed to go on forever. I brushed on several coats of black in the space between the tape, let it dry and then removed the tape. Using a minimalist approach, I wanted the viewer to ponder where she was and where she was going. Cable News is a satirical look at the spewing of news, which seems endless. This house can no longer contain all the information from television, the internet and newspapers. After gesso dried on the watercolor paper, I began to use a palette knife to randomly spread blue and white paint across the paper. As I worked it, a design began to form. While the first layer of paint was drying, the title floated across my mind and the fun began. I worked paper strips into certain areas to create a ticker-tape effect and looked for other media-like images to develop. I laughed as I painted, especially when I found a bucket and shovel hanging, ready to use to shovel the garbage that was spewing.